Finally…The Brewer’s Blackbirds have arrived here at California Alps Cycling HQ! A sign of spring for certain! A Brewer’s Blackbird showing off the iridescent blue that is so cool. We’ve also seen robins, yet another sign, and just this week, our first hummingbird visitors – an Anna’s and a Rufous. The Aspens are starting to bud and the rivers and streams are flowing (almost raging). There are waterfalls a plenty and the lakes are starting to thaw. And, that shiny, bright orb in the sky can be seen most days. Most importantly, at least from my perspective, I can get some serious riding in – outside. 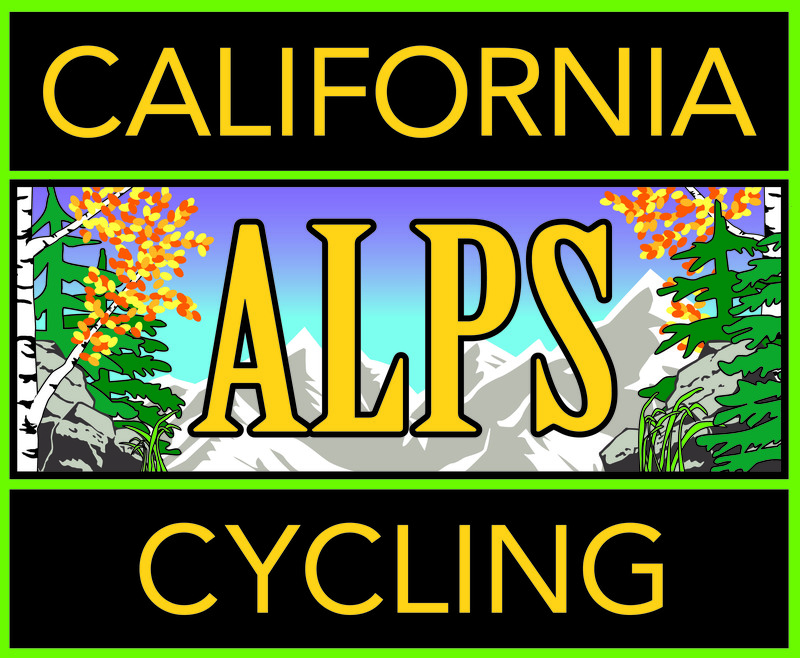 Just last Sunday, fellow CA Alps Cycling member Chris Schull and I, did just that! We started in Genoa (best bar around), went up to Spooner Summit, around part of Lake Tahoe, up Luther Pass and into Hope Valley, back down Woodford’s Canyon (Hwy. 88) and then, after fighting serious headwinds most of the day, we were blessed with a screaming tailwind all the way back to Genoa. We both PR’d 40k in about 57 minutes! My previous was about 1:07. We froze our hineys off for most of the day but that last leg was wondrous – you probably could have scraped bugs from our teeth due to our ultra-wide smiles. ‘Twas a great day indeed! Click here to check out my Relive video of the ride. So, if you haven’t made plans to come up to the Sierra soon, I strongly recommend it. Fishing season on rivers and streams opens on April 27th and there are myriad Earth Day celebrations, clean-ups and festivals happening everywhere. In fact, as part of our mission to “help the communities in which we live, work and ride” we are taking part in a clean-up day on May 5th. We’ll be doing some garbage pick up on the 3-mile stretch of Hwy. 89 that we’ve adopted, as well as some other work around Markleeville along with other members of the community and the Markleeville Enhancement Club (founded by my friend, and former Co. Supervisor, Mary Rawson and me). We’d love to have you join us. Let me know if you’re interested by commenting on this post, or send me an email (mschwartz@californiaalpscycling.bike) if you prefer. The Alpine Trails Association is making plans to work on the Thornburg trail, once the snow clears, and I’ll be out there doing what my crew chief tells me to (with my new Pulaski). Al’s Got Gas has recently opened (used to be Markleeville Gas) thanks to our friends, and local philanthropists John and Karrie Baker. They are getting ready for their grand opening on the 27th and not only will they have fuel, but also fishing supplies, fun things to do for the kids, and FatBike rentals (with tours led by yours truly). I’m also VERY EXCITED to announce that we’ll be opening our first retail outlet at Al’s. We’ll have tees, jerseys, bibs and vests, cinch packs, and decals for sale. Stop on by and get some fuel, munchies and cycling schwag! Another plug for the Bakers…They also own the Alps Haus Cafe (awesome sammies and soups, and cold beer) so you can get some good grub, too. We hope you too are partaking in the wonders of Spring and hope to see you soon here in Markleeville. Let me know when you’re coming up. I’d be happy to show you around. There’s a Great Blue Heron there in the middle of the river – on the rock just to the right of the little Spruce tree. Snapped this image from HQ just this morning. It’s going to be a beauty day! Well, okay, you got me. I’m not really in Australia, at least physically. I don’t know, is it still real if you’re there virtually? Don’t get me started on that philosophical discussion. The title of this post is somewhat of an ode to my latest recommended app, Fulgaz. Different from Zwift, it allows you to do solo rides all over the world, including Australia. It’s not as competitive (I’ve yet to try the challenge feature as I just recently subscribed – after my 2 week trial) but it’s a nice compliment to Zwift, and vice-versa. After riding a bit over 400 miles in February I was grateful to have both apps. And with an Apple TV combined with a bigscreen in my paincave, apps running on the Mac or the iPad (fewer, if any connectivity issues I’ve learned) – I set up a tripod with a laptop tray and so I’ve got a bit of mission control – and good tunes on the earbuds it’s not too bad at all. I go with Apple Music but there are myriad music options out there. Here’s a little glimpse of my pain-cave, which doubles as a guestroom. Notice the high-tech fan and the custom towel rack? Hey, whatever works, right? What about you? What do you do to stay in shape when it’s too chippy to go outside? We’d love to hear from you. Comment on this post and share your advice! My wife and I moved up here to Markleeville in October of 2016 – just before that winter kicked into high gear. My original plan in dealing with the snow was to shovel it. It would be a great workout I thought. That lasted about two (2) weeks. The call to Sears for the snowblower went out one morning and we picked up the ‘blower that afternoon. Major kudos to the inventor of that little gem! Fast forward to this year, after a low volume winter of snow and rain last year, and as Yogi Berra would say, it’s deja vu all over again! I don’t have any hard data to compare this year to last but from our persective (not just mine and the wife’s but other locals too) this year has been snowier and colder than that epic winter. As I write this post this morning it’s 2 degrees. We’ve seen several days of negative temps too yet I only recall one “minus-day” in the winter of ’16-17. Shoveling a path so we can put out the garbage. Our work (for that day) is done. I also remember that I was able to ride a bit more outside during our first winter. Some of that was behind the locked gates at the junction of Monitor and Ebbett’s passes, which by the way I no longer do. I was a bit naive when I first arrived in the Sierra but after a couple mechanicals behind those gates I quickly realized that it wasn’t such a good idea – what if something went seriously wrong? Nonetheless, I was able to get up those roads that year. Not so, this year. There are feet of snow now whereas in that winter there was none! Rocking the Mapei jersey on Monitor Pass. Winter of 2016. Thankfully, there are cycling apps like Zwift and FulGaz that allow those of us who live in the colder climes to get those miles in. Sure, it’s not nearly the same as riding outside but it’s riding at least. Combine the apps with a smart-trainer and it’s pretty cool. In the interests of full disclosure I must admit that the technology can sometimes be a little frustrating. I’ve been going through some major gesticulations with my current trainer – getting the power calibrated correctly or making sure I have the right dongle can be a bit trying. In fact, my new trainer arrived yesterday. BOLO (be on the lookout) by the way for a future post on my (and other California Alps Cycling members) timely trainer tips and tribulations. So my story of woe continues…I’ve not ridden outside at all this month. While there have been a couple days where it might have been warm enough (if you call 25-30 degrees warm enough) there was either too much ice on the roads or too much snow on the shoulders (the road’s, not mine). I’ve logged just over 300 miles this month and have done so in such places as Australia, Belgium, Innsbruck, Watopia, London and the Marin Headlands. All virtually of course. Happy Saturday to you all! Today I think I’ll go to a new destination – after I set up my Wahoo Kickr. If you hear me cussin’ you’ll know why. I’ll leave you with this little ‘cicle, as opposed to cycle, video. Ride safe and Let’s Kick Some Passes’ Asses! Even if they’re virtual passes. I’ve seen lots of icicles in my days here but none quite like this one. It’s Often Windy Here in the California Alps – Why is That? As a San Jose native, I was very familiar with the wind patterns. I lived in South San Jose for many years and could plan my rides knowing pretty well how the wind would blow: Go out early and get the tailwind on the way home. Go out later in the afternoon and get the headwind on the way home. Certainly this did depend on the direction of my ride but for the most part I could easily predict the patterns. So, what’s the deal here? Well, thanks to “A Sierra Club Naturlist’s Guide” by Stephen Whitney I’ve found some answers. Okay, so that makes sense. It’s somewhat analogous to the flow of a river. Rocks = rapids. Eddies are often downstream of those big rocks and flat water can bee seen where there aren’t any big rocks to interrupt the water’s flow. Let’s dive a little deeper, though. Why is it that I can head up Hwy. 4 (Ebbett’s Pass) with a headwind and then not get that tailwind on the way back? Okay, sometimes I do get the tailwind but it’s not consisent like it was in Silicon Valley. Well, Mr.Whitney has a bit more information in that regard. It’s about mountain breezes, valley breezes and the mountain ranges “intrusion” into the tropopause. So, there we have it! Mountain winds, mountain breezes and valley breezes combined with the myriad canyons, crests, passes and that ol’ tropopause challenge those of us who cycle in the California Alps. It’s a rare day when we have no wind and due to the topography you can’t count on consistency. If you ride here then you, grasshopper, like I, need to learn to embrace the wind.